Late in 1775 the delegates to the Continental Congress realized the need for a unique symbol of the unity of the thirteen American colonies. They appointed a committee, which included Benjamin Franklin of Pennsylvania, Benjamin Harrison of Virginia and Thomas Lynch of South Carolina. The three men consulted with revolutionary leaders like George Washington, but did not ignore the many Colonial leaders who were opposed to separation from Great Britain. 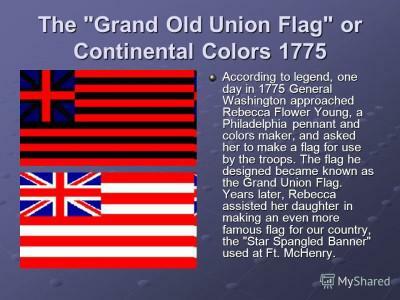 The resulting Grand Union Flag may have been one of the first examples of compromise in the development of a new United States. Designed by Francis Hopkinson, who later signed the Declaration of Independence, the new flag had thirteen alternating red and white stripes to symbolize the unity of the American colonies. The field of blue in the upper left corner included the British Union Jack, consisting of the cross of St. George of England and the cross of St. Andrew of Scotland. The Grand Union Flag, also known as the Continental Colors because it represented the entire nation, is considered our first national flag. After the Congress authorized the creation of a navy, a new flag was required to distinguish our ships from British vessels. The Continental Colors were first hoisted on the Alfred, in Philadelphia on December 2, 1775, by a young Navy lieutenant named John Paul Jones. This event was documented in letters to Congress. On January 1, 1776, American troops raised the Grand Union Flag on the liberty pole at Prospect Hill near Cambridge, Massachusetts, where General George Washington had taken command of the Continental Army. It was the official flag of the American Colonies on July 4, 1776, when the colonies declared independence and severed all ties with Great Britain. This same flag represented the free and independent people of the Colonies on September 9, 1776 when Congress gave their new nation a name: the United States. Despite the famous depiction of “Washington Crossing the Delaware” painted by Emanuel Leutze in 1851, it was probably the Grand Union Flag that crossed the river with General Washington and his men. 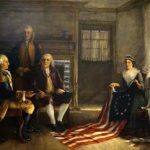 Betsy Ross is credited for sewing the first flag from a pencil sketch handed to her by George Washington in the spring of 1776. No evidence for this exists, and nearly a century passed before Ross’ grandson first publicly suggested it. Although the Betsy Ross legend is controversial, the design is among the earliest thirteen-star flags. In 1781, Rebecca Young ran an ad in the Pennsylvania Packet advertising “all kinds of colours for the Army and Navy.” In addition to flags, she was also paid for making blankets and drum cases between the years 1780 and 1785. After the War, in October 1784, she was paid for sewing the Standard of the First United States Regiment. The first known colors carried by a regular army unit after the Revolutionary War was of silk and referred to as a standard. This flag and four small camp colors were made in Philadelphia in October 1784 for the First United States Regiment. The ground of the standard was sewn by Rebecca Young. Rebecca Young is also noted for her many family connections to important figures in United States history. Her son Dr. Benjamin Young learned his profession from Patriot Dr. Benjamin Rush, a signer of the Declaration of Independence. 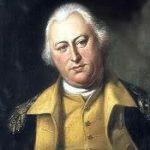 Her brother, Colonel Benjamin Flower, was credited with saving the Liberty Bell when British forces captured Philadelphia. 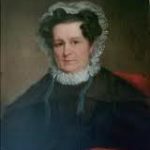 There are no further records of Rebecca Young, but her daughter Mary Young Pickersgill of Baltimore was a “maker of ships banners and flags” under contract to the United States government. In 1813, assisted by her 13-year-old daughter Caroline, Pickersgill continued the family tradition by making America’s most famous flag. During the War of 1812, British forces advanced up the Chesapeake Bay to attack Fort McHenry at Baltimore, Maryland, in September 1814. By the following dawn, it was discovered that the British had fired between 1,500 and 1,800 rounds at the fort with little impact, and the British began their retreat. As the sun began to rise, the fort’s small storm flag was lowered and replaced with the garrison flag sewn by Pickersgill. Measuring 30 feet by 42 feet, the flag was clearly visible to all of the ships in the harbor. The sight of the flag and the ineffectiveness of the 25-hour bombardment inspired Francis Scott Key to write the words to The Star Spangled Banner. The 30 by 42 foot flag was begun in July 1813 and finished on August 19, when Pickersgill wrote a receipt for payment of $405.90. It contained 400 yards of first quality 18 inch woolen bunting; the 15 stars were made out of cotton, each measuring 2 feet in diameter; the blue union measured 16 by 20 feet and had eight red and seven white 2 foot wide stripes; the whole sewed by hand with linen thread. 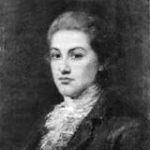 According to the Smithsonian Institution, who now has custody of the flag, Mary Pickersgill was asked to sew the flay by Commodore Joshua Barney (who was shortly to become the best known hero defending Washington, DC) and General John Stricker of the Maryland Militia. Caroline Pickersgill Purdy later wrote that her mother devoted particular attention to reinforcing the topping or heading of the flag.